Nigerian food going mainstream? Yes, please! I am so excited to be reviewing this product, and even more excited to be giving some packs away to selected readers. Keep reading to find out more. 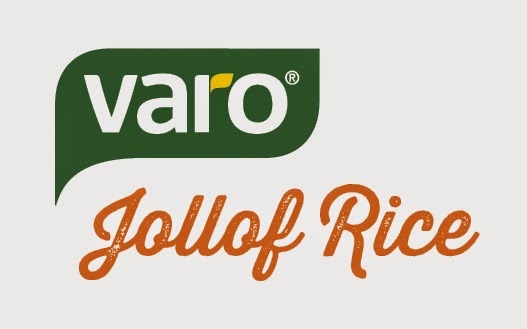 Varo is a recently established company founded by Omamo Binitie, a Nigerian-born entrepreneur based in London. Their first product launch in February 2013 was ready-to-eat moin moin, available in over 100 shops across Britain and Ireland, including one of the largest supermarket chains, Tesco. Their latest product launch is the incredibly moreish jollof rice in two variations - plain and with vegetables. As I've mentioned before, jollof rice is probably my all-time favourite dish and so the idea of it being available to a wider audience across the UK at such an affordable price (it will retail at £1.60) is a thrilling prospect! Two minutes in the microwave and I had a delicious portion of jollof rice in front of me. At that precise moment, it struck me just how revolutionary this product is. With over 1.5 million West Africans living in the UK, any one of them could be having a lazy day and in the mood for a familiar taste of home without the stress and effort of cooking from scratch. A quick visit to their local Tesco store for a pouch of Varo jollof rice and they'd be sorted! Beyond this core target audience, non-Nigerians will finally get to see why Nigerian cuisine is worth checking out. What makes all this even better is that Varo's products are free from artificial preservatives or colours, and are 100% natural. I can't rave enough about how fresh the rice tastes, and there's just enough spice to satisfy those who like a bit of heat, but not too much to make it inedible for those with more sensitive taste buds. Not content with just trying it by myself though, I had it as a meal with one of my housemates, Elisabeth, who is now excited at the prospect of making it a regular addition to her weekly shop. Says it all really. Would I eat this again? Absolutely. Varo was generous enough to send me a mouth-watering stash and I get to share some of it with you too. Show some love and check out Varo on Facebook, Twitter and YouTube! 3 winners. Each will get a box containing six Varo Jollof Rice pouches. Winners will be notified on Monday 14th July. If I don't hear back within 2 days, another winner will be selected. Now, that is something to look out for! Yaaay!!! Let me share now :) Pick me! Pick me!! Awesome! Sad it's not at our Tesco's so hoping I win! !